> - The formation has 7 Ring circles and 5 circles. > - The Formation's length is lined up with true North on a compass. > - The Formation has a total length of 309' Feet and a total width of 264' feet. > - A cemetery is located approx. 300 to 350 yards to the east of the formation. Has and underground well, and possibly has ties to a ancient Shoshone burial ground. > - The formation was laid down over sprinkler pipe in several locations. > - We arrived at the circle Wed. August 14th, 2002 approx. 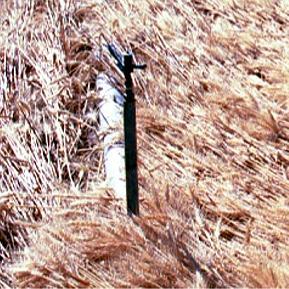 3:30 PM.- 108 hrs after it was discovered. > - When we arrived, we found Brenna Parker along side the road selling aerial photos and T-shirts of the circle found on her family's property. We introduced ourselves and asked for permission to go out and investigate the circle. Also asking several questions about the circle, etc. She had told us that they already had let many people check out the circle since it was discovered early Sat. morning. > - A Dark helicopter was seen hovering over the formation the night before. > - We spent approx. 3 1/2 hours inside the circle. >. - According to Connie Parker, there were no tracks leading into the circle when it was first discovered. > - Also she said there was 3-4 moose trails in the surrounding crop. > - We entered the circle from the south along a tram line, entering the south circle, (or bottom circle). > - We found no apparent initial entry trails under the downed crop on any of the circles. > - We did find trails through the center of the standing circles, which is seen in the original photographs Bryon Parker took from the air. which is possible evidence of human involvement. > - The Formation had only approx. 4 circles in prime condition when we arrived. 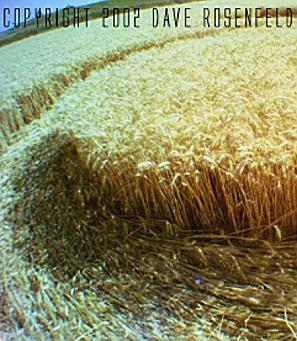 > - The wheat the crop formation is located in, is approx. 30 inches high, Dry, and ready for harvest. > - We found and collected several examples of Node Expansion and "blown nodes"/ expulsion cavities - using several "control" samples taken from outside the formation. 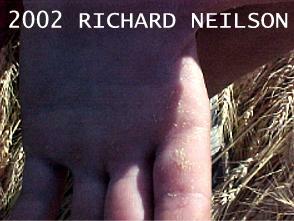 > - The Nodes that were blown or displayed expansion were the 3rd or 4th nodes down from the wheat tops. > - We found that all stalk "heads" or wheat tops had seeds and found no visible differences in the crop seeds inside or outside the formation. > - We found no examples or evidence of magnetic material. > - We found a grasshopper inside the circle with no apparent behavior change and seemed in good health. > - We found no distinguishing center holes or marks leading to the use of such tools. 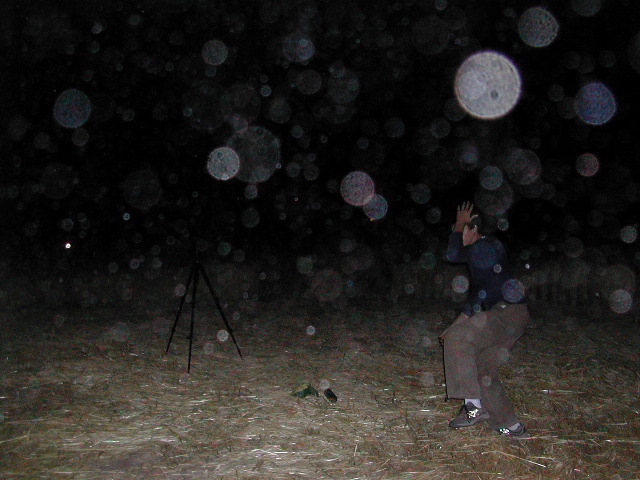 > - Several Anomalies were photographed in the circle and surrounding area by several UUFOH investigators. > - We spent some time afterwards interviewing the family, and various others in retaining information. South circle or Circle "A"
- measured 23 ft in diameter. was laid down in a counterclockwise pattern, was pretty well trampled and had a good sized entry path from the road leading into it. 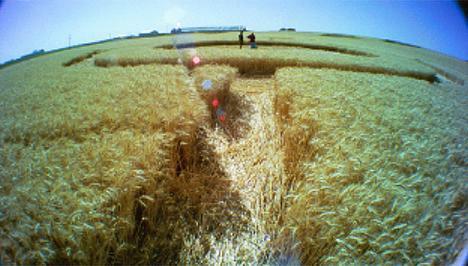 South circle - Ring Circle "B"
- measured 29.4 ft - 29.6 ft variable diameter, the "ring" was 4 ft wide with a center of standing crop 21.4 ft in diameter. Laid down in a counterclockwise rotation, and was also well trampled. South circle - Ring Circle "C"
- measured 44 ft in diameter. the "ring" was 4.6 ft wide. Laid down in a counterclockwise rotation. well trampled, with a center of standing crop 34.8 ft in diameter,with a footpath or trail going through the center of the standing crop. - measured 65 ft in diameter. Laid down in a counterclockwise rotation. had an usual center spiral ( oblong) and was extremely trampled. - It was surrounded by a ring of standing crop 13 ft in diameter. NOTE: sprinkler head and pipe located just outside circle ( 4inches off center) to the north running along tram line. Tram line going through bottom portion of circle. measured 9 ft wide, and 87 ft in diameter. Laid down in a counterclockwise rotation. and was also well trampled. NOTE: crop was laid down over Sprinkler pipe 2 times in "Main" circle Ring. Off of the "Main" circle was two straight lines, one going to the right circles and one going to the left circles, both measuring 23 ft in length and 3.4 ft - 4 ft wide. laid down in direction towards outer circles, -one east, one west. The Right circle - Ring Circle "D"
- measuring 41.6 ft in diameter, the "ring" was 4.2 - 4.6 ft wide, Laid down in a clockwise rotation. and was well trampled. 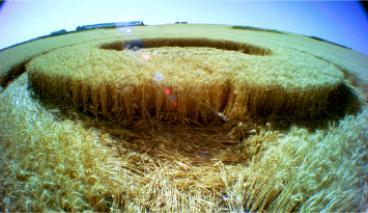 The Right circle - Center circle "E"
surrounded by a ring of standing crop 7 ft - 9.6 ft variable diameter. 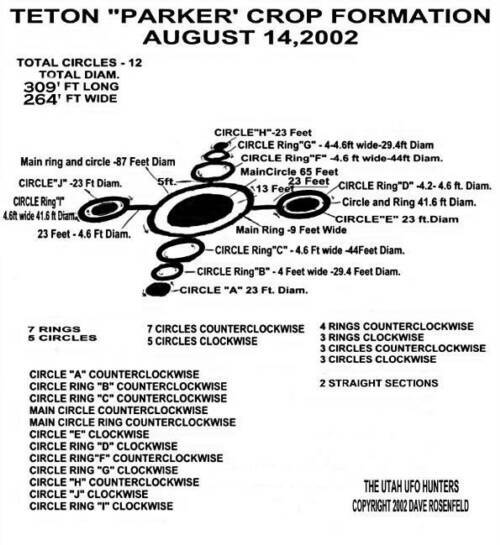 The Left Circle -Ring Circle "I"
- measuring 41.6 ft in diameter, the "ring" was 4.6 ft wide, Laid down in a clockwise rotation. and was in very good shape. 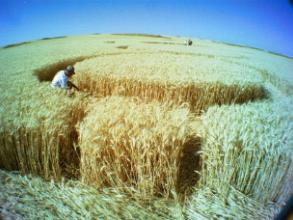 The Left Circle -Center circle "J"
- measured 28 ft in diameter, Laid down in a clockwise rotation, surrounded by a ring of standing crop also 7 ft to 9.6 ft in diameter - was in excellent shape. and Node samples taken from this circle were the best examples. North circle - Ring Circle "F "
- measured 44 ft in diameter, was 4ft - 4.6 ft wide and laid down in a counterclockwise rotation. with a center of standing crop 34.6 ft - 34.8 ft in diameter, trampled but not too bad. North Circle - Ring Circle "G "
North Circle - Circle "H "
- measured 23 ft in diameter, laid down in a counterclockwise rotation. was in excellent shape with a very good center spiral. There was some "Wind" damage to the right of formation with the larger having some spiral pattern in the center. 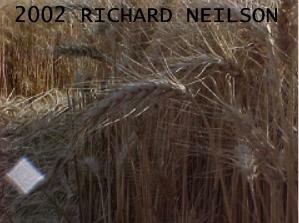 - Don Anderson said the crop and ground "felt" different inside the circle, and the air was also strange. - Susan Wenstad said she witnessed light "Orbs" while inside the circle and when leaving the circle she felt an energy shift. - Dave Rosenfeld said that he didn't notice anything strange or unusuall when entering the circle but when leaving, he also felt an energy shift. He also said the ground felt cold when feeling it under the main circle. - Ryan Layton said he didnt feel or notice anything unsusuall in his time inside the circle, he was just wound up being in another crop formation. Alan Meyer was also there when we were doing our investigations, he stayed until late that night getting some spectacular video and photographs of anomalous lights and orbs. Sprinkler Pipe running through formation (Main circle ring) with crop laid down over it. Crop flowed over the pipe without breaking the stalks VERY UNUSUAL We were later told by Nancy Talbot BLT Research that we should have sampled extensively by this pipe.
" Amazing in its Quality & Totally Beautiful !" Formation looking south towards road. www.unknowncountry.com for helping in spreading this information, his link to this page & giving our site a record number of hits. for the Great article they put out mentioing UUFOH and using our diagram. A resident of TETON witnessed bright moving anomalous lights over the formation approx 0230 HRS Sat morn. Aug 10 . 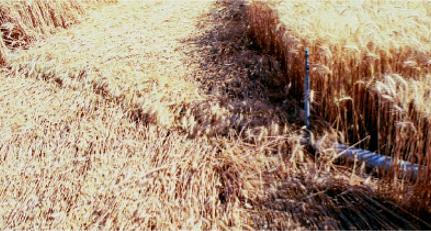 This formation was authentic as I noted ..expulsion of the node cavities in the stalks of wheat. "it was so light outside"
l Also a mystery light hovers over shop in front of witnesses. Mystery Light/possible UFO was spotted by the land owner, Byron Parker as it hovered over his machine shop at the western edge of the formation field. Spinkler head in left circle. with crop flowing over the pipe and around the sprinker heads. again without breaking stalks. green "dust".and collected sample to be analyzed. look at it close...it's like a funnel that comes from behind his hand.He had short sleeves on. l The similarity of this design and the celtic cross is noted. One of the south Rings with a possible blue orb? This daylight photo shows what might be a "Orb" or light ball.& Yes thats Alien Dave. 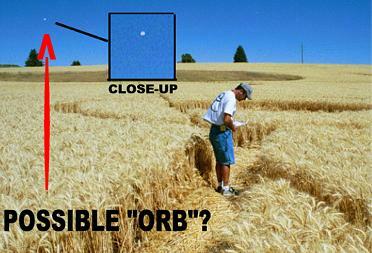 Not a Digital Camera, like most Orb photos are. September MUFON - UUFOH meeting and spoke about his experience there at the Teton Cropcircle. Taped in "Nightshot" mode with a handheld Sony TRV110 digital camcorder. Well, the green stuff turned out to be " ABS", a polymer resin used in construction coating. It may have come off some farm equipment or something. I thought is was strange that it had the same flourecent green color that the other green substance from College Ward had. Nancy Talbot said it looked yellow to her so maybe it just took on the green look inside the formation? "There had been a green, dust that had stuck to people's clothes early on after they had lain in the circles."